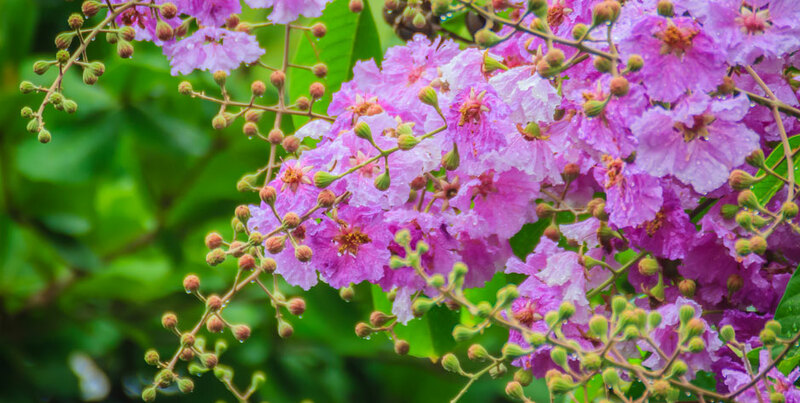 Our fascination with India continues with this tour of the south, where huge trees provide shade and colour, palaces are luxurious and flowers are abundant. Walk in the footsteps of the Portugese, Dutch and British colonists. Sample the mouth-watering taste of Kochi with tamarind, coconut and traditional spices. 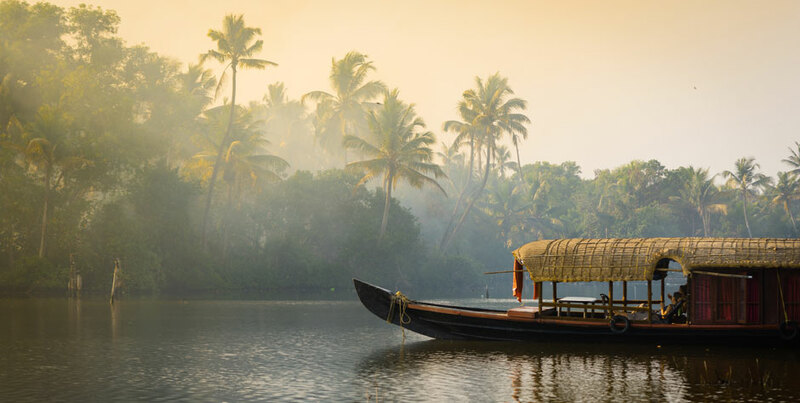 Cruise the palm-fringed watery wonderland of Kerala. Meet your Tour Leader, Libby Cameron, at Sydney Airport for the flight to India. Fly to Bangalore via Singapore, arriving late in the evening. Our tour begins in an historic part of Karnataka State. Bangalore is known as the Garden City but also boasts the Silicon Valley of the subcontinent. Along with Mysore, Kochi and other cities, the colonial rulers planted thousands of rain trees, ‘Albizzia saman’, and these huge old trees provide welcome shade, greenery and character. 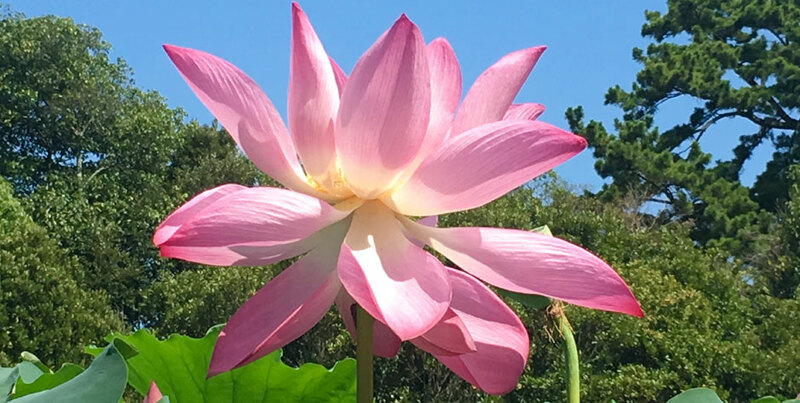 Leave Bangalore this morning and drive to Mysore, with a stop to see the Lal Bagh Botanical Gardens. We’ll hire buggies to see fabulous flowering trees and the historic shadehouse. Next stop is lunch in Channapatna, known for its hand made wooden toys. Check in to our hotel, the modern Radisson Blu. Mysore was the capital of Mysore state until 1956, when it was absorbed into the new Karnataka state with the capital in Bangalore. 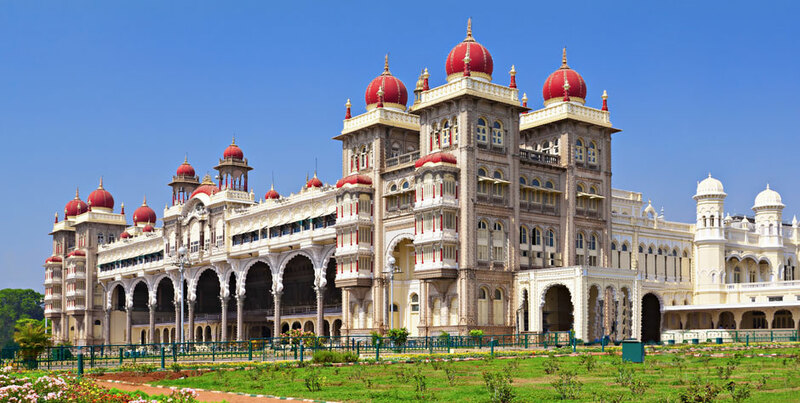 The Wodeyar dynasty ruled Mysore from 1399 until independence, apart from a brief period in the late 18th century. The Wodeyars were known as enlightened rulers and great patrons of the arts and culture. The legacy of this patronage lives on with traditional the Mysore style of painting. It’s a fascinating city famous for its plush palaces and fabulous festivals, elegant streets, mild climate, production of sandalwood, silk and incense. Early morning drive up Chamundi Hill to the 12th century Hindu temple and the giant granite Nandi, a representation of Shiva’s bull. Pilgrims climb the 1000 steps! Panoramic view of this ever expanding city. Next stop is Mysore Palace, finished in 1912 after the original palace burned down in 1897 during a wedding celebration. It’s a fine example of Indo-Saracenic architecture, lavishly decorated. We’ll visit the four public halls and learn about the Wadiyar rajas. Afternoon walk into the famous Devaraja markets, with stalls selling fresh fruit, vegetables, brightly coloured powder, fragrant oils and trinkets. And the flower markets, with the fragrance of jasmine, Mysore’s emblem, wafting through the covered walkways. See stallholders weave its flowerbuds into necklaces. As darkness falls our last stop is back to the Mysore palace, illuminated with 100,000 light bulbs. We’re heading to Srirangapatnam, once the capital of the Mysore Wadiyar rajas, to visit the Daria Daulat Bagh, the Summer Palace of Tipu Sultan, the ‘Tiger of Mysore’. Tipu Sultan used this palace as a retreat from the strenuous life of a king. It’s made of teak and built in Indo-Islamic style with richly painted timber frescoes. Mysore is a major centre for the production of sandalwood, incense and also silk, which we’ll see at the KSIC Silk Factory. A special dinner this evening in the Elephant Bar at the Royal Orchid Hotel, will give us a dress circle view of the evening light show. We’re heading to the ‘Queen of the Hills’ this morning, climbing high into the Nilgiri Hills to Ooty at 2,240m above sea level. This colourful hilltown was once a popular weekend escape (from the coastal heat) for British Colonials. 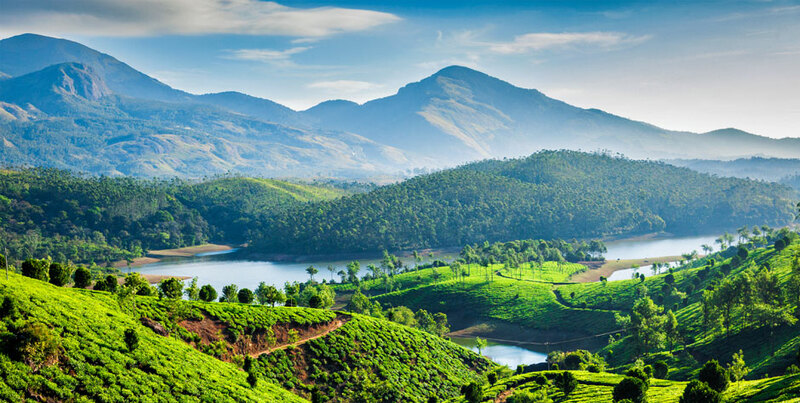 The Nilgiri Hills are known as the Blue Mountains, because of the haze from the large plantings of Eucalyptus that were planted in the 1850’s to provide fast growing timber for firewood. More were planted indiscriminately in the 1950’s for pulpwood and as fuel for a rayon factory. This controversial Australian tree provides oil for a thriving commercial and tourist enterprise. Next stop is the newly created Karnataka Siri Horticulture Gardens at Fern Hill. Just a few years old, these gardens have become known for topiary, maze, and the flower displays in the gardens and glasshouse. Check into our hotel, Taj Savoy. Dinner is included tonight in the hotel. Morning visit to Ooty Botanical Gardens laid out in 1847, with wonderful collections of trees and shrubs. They’ll be busy preparing seedlings for their annual show in May, needing to protect them from late frosts. There will be time to buy some of Ooty’s well known home-made chocolates then drive to Coonoor, a nearby hill town, to catch the famous Nilgiri Toy Train to Mattupalayam. This scenic journey winds precariously downhill past tea plantations, through tunnels and across ravines to its destination. Our coach will meet us at the station and drive us to the Hotel Vivanta by Taj Suriyas in Coimbatore for dinner and an overnight stay. A modern train journey today, from Coimbatore to Kottayam, where we meet our coach for the drive into the Western Ghats to Thekkady for two nights’ stay at Spice Village Resort in the Periyar Forest. This is an area of rolling hills, hill towns, fruit trees, rubber and spice plantations. The Periyar forest of Thekkady is one of the finest wildlife reserves in India. Dinner will be included tonight. 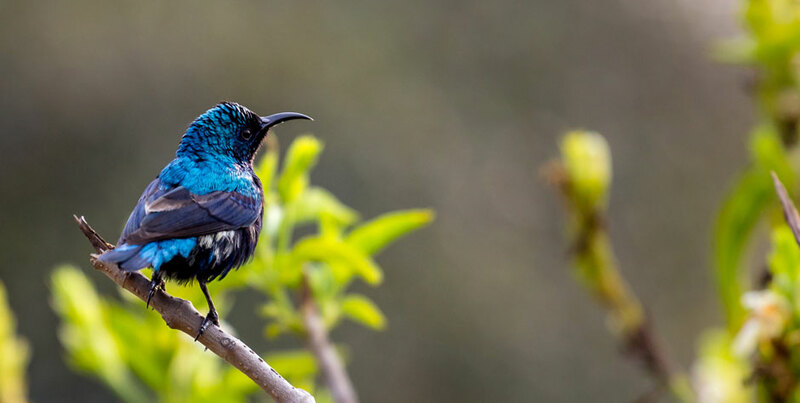 A day in the hills: wake to the sounds of birds in the forest and spend the morning in spice plantations, with a visit to Abraham’s Spice Gardens. Evening visit to Kalaripayattu Martial Arts studio. This form of martial art is considered one of the oldest surviving fighting systems still in existence, related to the medical discipline Ayurveda. Morning drive back down to the lowlands to Kumarakom. It’s a cluster of Islands on Lake Vembanad’s enchanting backwaters. Check into Kumarakom Lake Resort for the next two nights. 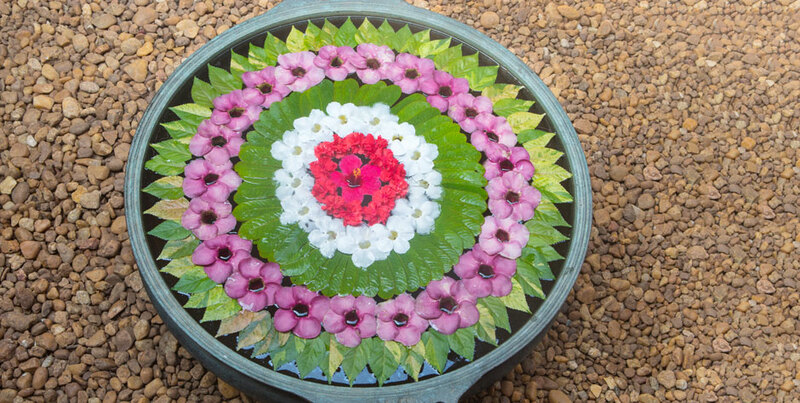 The remainder of the day is yours to relax and float in the warm waters: enjoy the facilities at Kumarakom Lake Resort. An optional late afternoon visit to the nearby Kumarakom Bird Sanctuary, then dinner at the resort. A late start today, lazy breakfast, maybe some yoga. Afternoon visit to Philipkutty farm, a working property on a man made island that practices sustainable/organic methods, producing coconuts, bananas, fruit and vegetables. We’ll arrive by boat and be welcomed by family members who will show us all the farm activities, give us a cooking demonstration, and make us lunch. 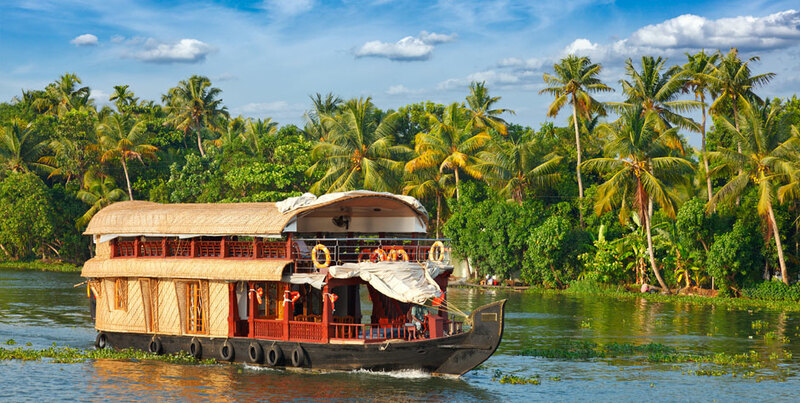 Time to relax as we board a houseboat (kettuvallam) for a leisurely cruise through the famous Keralan backwaters. We’ll be served local fish and other culinary fare from the onboard kitchen with fresh coconut water. You can catch your own fish if you wish to dangle a line! The boat will tie up at a jetty for a view of sunset over the palm trees and a night on board in your own cabin. It’s a gentle journey through narrow waterways and past villages where friendly locals are busy with their daily tasks. Disembark after breakfast and head straight to Kochi, one of the most famous and historic cities of Kerala, with remnants of Portugese, Dutch and British colonies. We’ll visit a number of famous churches linked to this city’s history: St Francis’ Church, Vallarpadam Church and Santa Cruz Basilica. Lunch is included at the Ginger House Cafe. Check into our hotel, Brunton’s Boatyard, situated in the historic area known as Fort Kochi. A treat tonight, performance of Kerala’s traditional classic Kathakali dance, which involves elaborate costumes and makeup, and intricate movements of hands, body, face and eyes. We’re off to see the Chinese Fishing Nets, Fort Kochi and Jewtown, including the Paradesi Synagogue and the Dutch Palace. The Cochin, or Malabar Jews, whose lineage traces back to King Solomon, settled in Kerala as early as the 12th Century. Several families from the Iberian Peninsula joined them later, in the 15th Century. 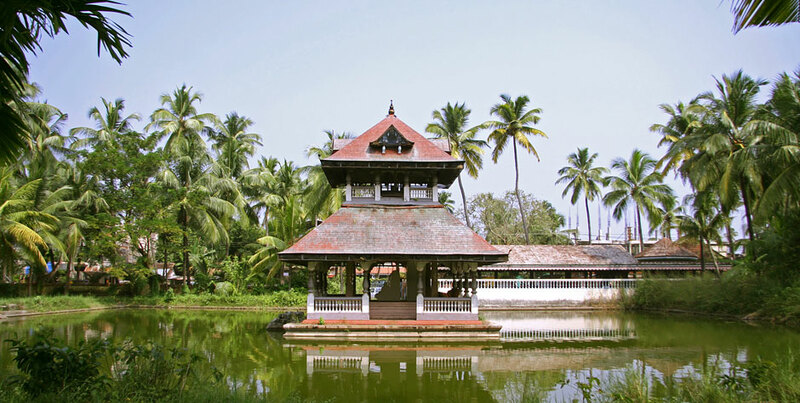 The Paradesi Synagogue is one of the many beautiful synagogues built throughout Kerala. Lunch stop then visit the Dhobi Khana, an historic Tamil community laundry. Farewell Dinner this evening in our hotel. Its a leisurely day today with no need to check out until we leave for Cochin Airport this evening. Enjoy the hotel’s facilities, take a walk through this historic area and browse the many shops and street stalls for last minute souvenirs. Our SilkAir flight leaves around 11pm for Singapore then onward with Singapore Airlines to Sydney. Entrance fees to all gardens and sightseeing including Lal Bagh Botanical Gardens, Chamundi Hill & Hindu Temple, Mysore Palace, Summer Palace of Tipu Sultan, KSIC Silk Factory, Karnataka Siri Horticulture Gardens, Brindavan Garden Light Show, Ooty Botanical Gardens, Nilgiri Mountain Railway, Sabari Express Coimbatore to Kottayam, Abraham’s Spice Garden, Kalaripayattu Martial Arts Studio, Philipkutty’s Farm, Kerala houseboat (kettuvallam), Kathakali Dance Performance, Paradesi Synagogue. Book and pay in full by 12/10/18 to receive the Early Bird Discount of $300.00 per person off the final instalment. Read what our tour leaders have written about India here. and Adelaide Hills. Natural wonders of Admirals Arch and the Remarkables at Flinders Chase National Park.